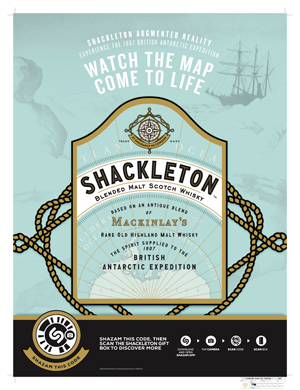 Shackleton Whisky is taking consumers back to its roots through a wild tale of Antarctic explorers and 25 cases of whiskey lost in the frozen tundra for over 100 years. 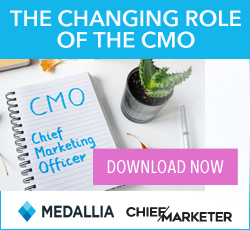 At retail, consumers will find gift boxes with peel-to-reveal stickers carrying codes that, when scanned with the music identification app Shazam, unlock an augmented reality experience that takes the viewer through Sir Ernest Shackleton’s 1907 British Antarctic Expedition to be the first to reach the south pole. The environment transports consumers into a 3D experience featuring actual time period footage of Shackleton and key moments of his journey, including leaving behind the whisky at the base camp where it sat frozen for over 100 years before 11 bottles were rediscovered. The experience, “Discovered Under Ice, Served Over Ice” shares how the rediscovered bottles of original Mackinlay’s rare old island malt whisky were taken to Master Blender Richard Paterson who analyzed the antique liquid and created the new modern Scotch, Shackleton Whisky, “which captures Sir Ernest Shackleton’s sense of adventure and bold character,” the company said. POS materials at retail as well as signage in bars lets customers try the AR experience without the gift box being present. Shazam, which originally launched as a music identification app, has grown into a content distribution platform, with Shackleton Whisky as one of its first brand partners. Software developer Zappar adapted the tale by using ZapWorks and 3D Studio Max cutting edge technology.